The mentors were so thrilled with the workshop that they would like to have a similar workshop just for their young adult groups. This will happen beginning in January 2020. These students were the latest group who attended one of our youth preaching workshops. They learned how to bring to life their baptismal call to “preach the Good News” by using the gifts and talents that have been given to them by our loving God. We began the weekend on Friday evening with Pizza, fun and prayer. After some ice breakers to create a more comfortable atmosphere we began by learning about St. Dominic and the Dominican Order. They were also told that they were now part of a bigger entity, the new corporation Dominican Youth Movement USA . . . they loved the thought that they were now part of a group that was nationwide. Each of the groups brought water from their schools which was blessed during the opening prayer and used to bless each other. So began our weekend together as a community of young Dominicans. After staying the night we arose early for breakfast and prayer and prepared for our trip to our Motherhouse. This is always a fun day for the participants who enjoy the presentations on preaching through Drama, Art, Music, and Dance. They had an opportunity to meet our retired sisters for an ice cream social on Saturday afternoon again lots of fun for all who participate. These young people are hungering for any opportunity to come closer to God. One need only listen to their reflections during our prayer times to hear the hunger in their hearts for relationship to the Divine! How blessed are we to be able to provide a venue to foster and ignite that relationship. The weekends are completed with the Sunday liturgy at our Motherhouse. 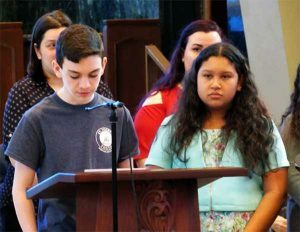 The young preachers used their newly awakened preaching skills by reading from scripture, bringing up the gifts, reading the intercessions, as well as leading the congregation in the responsorial psalm with hand gestures. 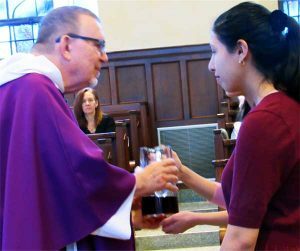 One of the young preachers gave a reflection on the Gospel, after communion that was very well received by both the other people attending the mass as well as Fr. Ron. Following the mass, the students and their parents were invited to join us for lunch in our dining room, a wonderful finish to the weekend. The participants continue to find the weekends very spiritual, prayerful and a great deal of fun. Most im­portantly, many stay connected to us after experiencing the weekend. 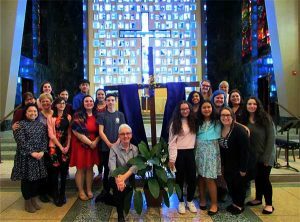 Some return as youth mentors and have the opportunity to lead a new group of young preachers, and some have volunteered on the 3rd and 4th floors as part of their service requirements at school. Some of these same young people will attend this year’s National High School Preaching Conference in Michigan. However they choose to stay connected, we are grateful for their presence amongst us. I am also grateful for the willingness of our sisters who reside here in the Motherhouse to come and join us for some quality time. I am sure that all would agree that these programs have been a blessing to the participants, and also to the Congregation-at-large in whose name the programs continue.